Defamation is a legal term that refers to any statement made by a person, whether verbal or printed, that causes harm to another person’s reputation or character. A defamatory statement made in writing, or “published,” it is considered “libel,” a defamatory statement that is spoken is considered “slander.” Defamation is not considered a criminal act, but a civil wrong. As the Constitution of the United States promises its citizens freedom of speech, there is often a fine line between exercising that right and making defamatory statements that harm another person. To explore this concept, consider the following defamation definition. Noun. A spoken or published statement that harms the reputation of a person. Noun. False statements that unjustifiably injure the good reputation of another person or entity. Defamation laws in the United States date back to before the American Revolution, and are much less stringent than in some European countries. For example, in Europe, a victim can sue a person for a separate case of defamation of character for every country in which the statement was made or published. American defamation law only allows a victim one claim per publication of a defamatory statement, regardless of how many places it was published. In addition, each state has its own definition of exactly what constitutes defamation, some more lenient than others. Harm to reputation – the loss of a job, loss of customers, causing the victim to become a social outcast. Financial harm – the victim, whether personally or as a business owner, experiences loss of business or money, or incurs expenses in the attempt to repair his reputation. Absolute privilege – refers to statements made by a person that cannot be used against them, such as evidence or testimony given in court. While false statements made in court may not be sued as defamation, the person making such statements may be criminally prosecuted for perjury. Qualified privilege – refers to statements made that are considered important for public interest. Such statements may include statements made in official government reports, statements made by lower government officials, statements made to warn others, and published reviews that may be considered fair criticism. 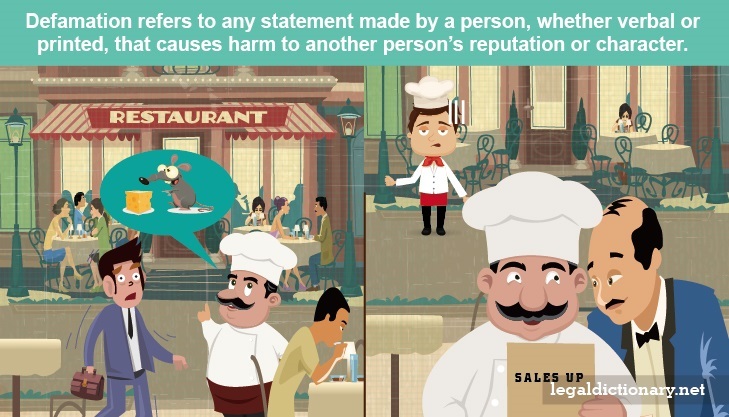 Statements made in good faith – the person who made the statements reasonably believed that the statements were true. Opinion – because opinions are considered subjective, and not necessarily false, they are not considered defamatory. Verbal abuse – if a statement made is not to be taken literally or believed, such as name-calling in anger, it is not considered defamatory. Unbelieved statement – if the person hearing the defamatory statement does not believe it, or does not take an interest in it, the statement is considered not to have harmed the victim’s reputation in any way. No consent – the victim must not have given consent to the person making the statements, whether verbally or in writing. There are special rules when it comes to statements made about public figures by people of the press. People who subject themselves to the public eye are offered less protection that individuals who attempt to keep their lives private, and are often required to meet a higher burden of proof in a lawsuit for defamation. Public figures must show that the statements were made with actual malice. Public figures are not only governmental officials, but musicians, celebrities, and authors. Reputation – A common opinion that someone or something has a specific characteristic; the way in which people think of someone. Publication – The act of making something generally known. Defamation means you intentionally spread lies that caused damage to the person. EX: If I said to someone that I thought you were a sheisty business man that was cheating your customers it wouldn’t be defamation because opinions are not considered defamation.